Lately it seems as if I just keep stumbling across stories in the media where the writer describes their conversion, away from Catholicism, usually citing a "Catholic" belief as the reason for their departure, that isn't actually a real Catholic teaching (or is in fact directly contrary to Catholic teaching). In one recent article the writer said her Catholic mother was part of the "cult of Mary" and raised her and her sister's to put Mary before God. In another the speaker acted as if Catholic's can't have a "personal relationship with God" and that he "finally found the church that he should have been born into." It's so sad that people leave the Church (and the Eucharist), without truly understanding what their faith teaches, and then spend their lives "recovering" (the new trendy term used by some who've "left" the Church) from something that wasn't actually real. It's one thing if a person thoroughly understands what the Church teaches and rejects it. It's another if they have an understanding of Church teaching comparable to a toddler (or an understanding worse than a toddler) and then throw out reason after reason that isn't grounded in reality, as if it were the truth. Adding to the tragedy is that other non-Catholics hear these lies (although they are usually unknowing lies) from a "recovering Cradle Catholic" and believe that that is, in fact, what the Church teaches. After all, it came from someone who was "Catholic" for twenty some years and must be true. If the speaker did a tiny bit of research the arguments would fall quickly to pieces... but that amount of effort appears to be too much for some, and they embrace what they are told by people who really don't understand the Church, and don't really care to. The best way to learn about a religion is to read it's actual texts to find out what it actually teaches. Reading tracts from groups that have a vested interest in luring people away means that you will be learning about a religion second hand, through (what is very likely) a thickly distorted lens. Before becoming Catholic I did explore other religions. I took classes on Islam (from Muslim teachers) and studied the Koran. I took classes on Eastern Religions and studied the Bhagavad Geeta, The Hundred Thousand Songs of Milarepa, the Tao Te Ching, and the Analects. And I found bits and pieces of truth along the way. Then I began to read the Bible. And I began to pray more. "You are light for the world. A city built on a hill-top cannot be hidden. No one lights a lamp to put it under a tub; they put it on the lamp-stand where it shines for everyone in the house." The media is always eager for an "I used to be Catholic story." With better catechesis I think we will begin to hear less and less of them. At least that is my prayer. On a side note... I think I have a problem with overusing ellipses. I've been trying to work on that, but tonight I think I've failed... and I'm too sleepy to fix it! On the other side of the coin... I once saw an old HS acquaintance at a diocesan adult ed class. She was teaching the history section. Upon expressing my surprise at not having known she was Catholic, she explained how she converted in college. The group she was friends with at the time were virulently anti-Catholic. She wanted to find out if all they were saying was true, so she signed up for the RCIA. Now you know the rest of the story. "All things work for good..."
This post is great! I am a shiny new convert and I've already heard some of this stuff from people who I had assumed would be a lot more supportive of my conversion. It's kind of bizarre. It's the Google age people! There's no excuse to be *so* misinformed. Congratulations on your conversion (and on expecting!)! I'm not sure how to get it to work on wordpress. I always just copied and pasted it into the layout. Any wordpress bloggers here who have ideas? Yes, yes, yes!!! My favorite is, "I was raised Catholic, but I don't think you have to go to confession just to tell God you're sorry. I think you can talk to God any time you want to - only God can forgive - not the priest!" It's funny I read this today because I *just* posted a review of a Max Lucado book on my blog and the problems I had with it were the anti-Catholic undertones. He sisn't outwardly say anything negative about "us" but he implied some things that an uninformed Protestant (or Catholic) could misundertand. The biggest example is the "Mary thing" as I call it. No where are we told that we HAVE to pray to Mary or the Rosary. 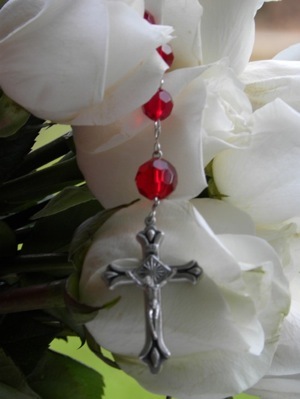 When I was in RCIA, my teacher (now Deacon) told us that it is no where in Catholic dogma that we have to do anything reguarding the Rosary. It is a tradition (a beautiful one) that some Catholics choose. Thanks for posting this! I don't feel so alone on this now! On the way to Mass this morning, we passed a very large, popular, active Methodist church; I know for a fact that there are many should-be Catholics who attend. I asked one friend who was a cradle Catholic why she left our parish, and she said there "wasn't enough for her daughter to do". the realities of their faith) Catholics that it is very sad. First, I have a wordpress blog and it doesn't allow for widgets - I have the free version. I think that some of their free templates do support widgets, but I don't know which ones they are. Also, the paid version allows more freedom as well. I have a lot of online friends who are non-Catholic Christians; and it's amazing to me the misconceptions that are out there; especially in this information age (like alekdrake said). I even rented a home from a strong evangelical. I basically had to just do a lot of nodding and tongue-biting when talking to her, because she had me beat when it came to defending the faith. I need to brush up on my Bible to be able to defend Christ's Church better. I do know that Bible-reading wasn't stressed as I was growing up. I heard someone say once that non-Catholic Christians take the Bible literally, except for the Real Presence; whereas Catholics don't take anything literally, except the Real Presence. Anyway, I have to admit that the best explanation of our faith has come from Jeff Cavins' Bible Timeline Adventure. It's incredible. I borrowed it from a friend and now I have to save up for a copy of my own. Ironic though, that it took a 'revert' to the Catholic faith to help this Cradle Catholic understand her faith better.